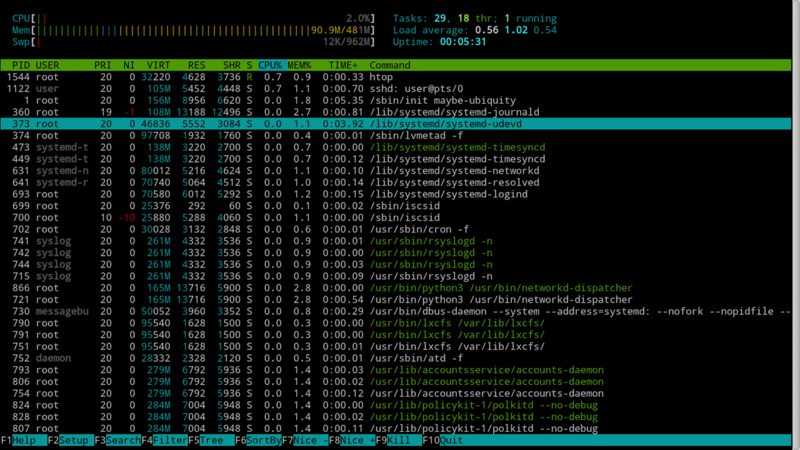 Htop is a real-time process monitoring tool for Ubuntu operating system. The htop command is similar to top command, but much improved version. Htop is not installed by default on Ubuntu 18, But available from the default Ubuntu software repository. After the installation is complete, type sudo htop in the terminal to check on the resource utilization of your Ubuntu system. At the top of the display, you will see the CPU and memory usage, load average and uptime of the server. Then, you see the list of running processes with their own CPU and memory utilization. Htop is a great command line utility that every Linux server should have. There is no better command to check on the resource utilization of your Ubuntu 18.04 server than htop command.